Each of the approximately 100,000,000,000,000 (100 billion) cells in the body of an adult originates from one single stem cell – namely the fertilized egg cell. This cell develops into a complete human being within only nine months. A masterpiece of nature! Stem cells are the building blocks of life. Reproduction and differentiation let them develop into more than 200 different types of cells. The natural tasks of stem cells are building, regenerating, and repairing. These abilities of stem cells, however, diminish already during the fetal development and become continuously less in the course of life. That is why especially young and viable stem cells are of particular interest for medical applications. A baby’s blood circulation contains millions of stem cells. After the umbilical cord was cut, a rest of this blood that is rich in stem cells remains in the umbilical cord. Between 60 and 200 milliliters of the valuable blood can be collected by puncturing the umbilical vein. The collection is simple, safe, painless, and without any risk for mother and child. The stem cells at this time are intact, usually free from virus, extremely agile, and divide at a fast rate. After high-quality processing and preparation, they can be stored at freezing conditions for decades, where they do not age and maintain their special properties and advantages. The umbilical cord is a very special connection between mother and child. It supplies the unborn with oxygen and nutrients and, in addition, removes metabolic waste products and carbon dioxide. Nature has come up with an ingenious blueprint for the umbilical cord to master the task. It contains many blood vessels, through which the umbilical cord blood pulses. For the blood vessels to withstand the stress and not to bend, they are covered by colloidal tissue to protect and support the cord. This umbilical cord tissue contains a particularly large number of mesenchymal stem cells, which develop into connective tissue, bone, cartilage, muscles, and tendons. Vita 34 is the only stem cell bank in the German-speaking countries offering the storage of umbilical cord blood and tissue, thus providing parents with the possibility of storing all the young and viable stem cells from the umbilical cord for their child. When you are profoundly informed, you will not throw away the stem cells from umbilical cord blood and tissue at birth. It is a one-time possibility to secure the stem cells for your child. Our extensive preventive screening service provides you with even more safety, and you can provide for others by means of the donating option. The preparation and transplantation of stem cells requires a lot of knowledge and experience. Vita 34 can prove the high medical quality of its stem cell preparations by means of already 37 applications of stem cells that were cryo-preserved previously and prepared for transplantation in top quality. For this purpose, we established a mobile stem cell transplantation team that is unique in Europe. We are still the only private stem cell bank in the German-speaking countries, the stem cell deposits of which have been actually applied. Vita 34 stem cell preparations were already applied in the treatment of cancers such as leukemia and neuroblastoma, hematopoietic disorders like aplastic anemia or beta thalassemia, immune defects like SCID or Wiskott Aldrich syndrome, infantile brain damage and infantile diabetes type 1. The in-house department of research and development of Vita 34 is involved in basic research and in application research. The purpose of our work is to improve the quality of stem cell reparations further and to enhance the possible applications of stem cells, umbilical cord blood, and umbilical cord tissue. Experts agree that the treatment including stem cells will be a firm component of therapies in future medicine. In collaboration with renowned universities and research institutions from all over Europe, Vita 34 researches new therapeutic options to treat stroke, heart attack, hematopoietic diseases, and diabetes type 1. In basic research, we collaborate for instance with Hannover Medical School to develop a procedure to extract induced, pluripotent stem cells from stem cells from umbilical cord blood. Leading scientists assume that every seventh person will need a therapy based on stem cells during the course of their lives in the near future. One reason is that people grow older and more and more people suffer from e.g. cancer or diabetes. Research in the field of regenerative medicine deals with restoring cells, tissues, and organs that were damaged by diseases or accidents, using young and viable stem cells. For this purpose, research of the therapeutic application of living cells and artificially grown tissue is pushed intensely in order to develop new therapeutic approaches for medical treatment. The long-term goal of regenerative medicine is to transplant whole organs that were grown in-vitro. Of particular interest in this regard are the adult and induced, pluripotent stem cells, as they are able to differentiate into various types of tissue. At this stage, fresh cartilage cell injected into damaged joints or worn intervertebral discs trigger processes to repair and regenerate available damages. Vita 34 is the specialist in storing stem cells from umbilical cord blood and tissue for medical precaution as well as producing stem cell transplants from umbilical cord blood.. Specially trained personnel collect cord blood and tissue right after the birth at the maternity clinic. This procedure is entirely without risk for mother and child, because the doctor or the midwife puncture the umbilical vein only after the umbilical cord was cut and collect the umbilical cord blood in a special blood bag. 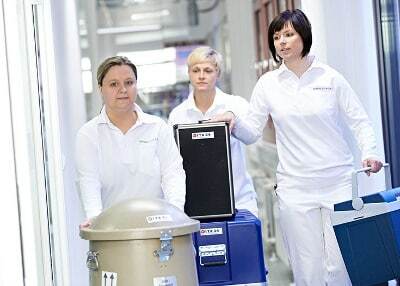 A courier transports the valuable freight packed safely and sterile in the specially developed transport box from the maternity clinic to the Vita 34 laboratory in Leipzig, where the viable and adaptive stem cells are prepared in top quality, tested and examined as well as stored. The stem cells remain intact in the cryo-tank at minus 180 degrees Celsius, because the aging processes in the cells are disrupted. While the child ages over the years and experiences diseases, the stem cells remain frozen and maintain their special properties. They remain young and unpolluted. Several scientific studies proved clearly that stem cells are fully serviceable, divide at a fast rate and trigger repair processes in the body when they were thawed after a few decades. Umbilical cord blood is thus available for an entire human life and can be thawed and used promptly, if necessary. An experienced team of stem cell specialists stands behind Vita 34, for whom the highest standards for stem cell preparations are barely good enough. In contrast to other cord blood banks, which separate the stem cells from the umbilical cord blood before freezing, Vita 34 stores the whole blood in order to preserve all ingredients of the umbilical cord blood. As an experienced stem cell bank, Vita 34 furthermore complies with the strict European and medical regulations. Vita 34 consistently implements the requirements of the GMP guideline, with GMP standing for Good Manufacturing Practice. The in-house quality assurance monitors all work steps and processes in the ultra-modern clean room laboratory and the cryo-tanks. This way, we ensure quality and safety on the highest level for decades. The experts of Vita 34 agree: The future belongs to stem cell therapy. That is our passion and vision of modern health protection. Take this unique chance for your child. A stem cell deposit containing stem cells from umbilical cord blood and tissue is an investment in health.